I never met Derek Miller. I take that back. I may well have met him, say at the Northern Voice conference, the annual gathering of the B.C. blogging and social media scene. I almost certainly heard him play drums; I’m told his band, The Neurotics, played at the start line of the Vancouver Sun Run, our annual 50,000 person 10k stampede. Certainly we had a lot of friends in common. But I became aware of Derek Miller through one of his intriguing ideas. I then grew to admire his bravery, his unsentimental clarity, his humour, his compassion, as he compellingly narrated his own journey towards death. And as the community, in which he made waves and I bob in the ripples, mourned him, it became clear how many people loved and admired him. I first came across Derek when researching what people were learning about digital legacies: what happens to one’s online persona and works when one dies. Derek apparently coined the term “digital executor”, the person who has the responsibility to take over all one’s blogs and accounts and presence on the net on one’s death. I think it is a brilliant term. I added Derek’s blog, penmachine, to my daily reading list. I was hoping for further wisdom about digital executors. What I got was much more. Derek was a fine writer. He was also confronting terminal cancer, at the age of 41. And he had the courage not just to face it, but to write about facing it. I learned about his good days, and his bad days. I read him tick off the birthdays, the holidays, the seasons, the elections — life events which he lived through, and talked about not surviving to live through again. It was a noble tale by a compassionate and funny and brave man. I read of his dear spouse and children, of his good friends, of his craving for US-only spray cheese and Diet Cherry Coke (requited by an alert team at Coca-Cola). To the end, he continued to create, to live, to love, and to enrich the rest of us. I wasn’t surprised that when I looked for a Creative Commons-licensed portrait of Derek to use in this post, I had plenty to choose from in Derek’s own photostream on flickr. When he finally died, he had a final blog post queued up, and some digital executor assigned to push it live. Go ahead and read it, but arm yourself with a handkerchief. And clear your calendar for an hour or two. Like chocolate chip cookies, it’s hard to stop with just one penmachine post. 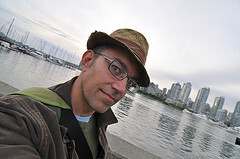 Such was Derek’s story, and his connection to so many in this community, that his passing was noted in the Vancouver Sun, the CBC, and the Globe and Mail. But the memorial that was closest to me, and which so hit just the right note, was Travis Smith’s farewell at the opening of Northern Voice 2011. Channelling Derek’s mix of affection, compassion, and clear-eyed unsentimentality, Travis paid tribute to Derek’s contribution to this collection of bloggers and social media inhabitants; but rather than let us bathe in the pathos of a minute of silence, Travis had us all chorus, “Goodbye, Derek”. And then life went on. With tears mostly welling in the eyes, rather than choking off the words. So, I never met Derek K. Miller. But like the rest of us, I respect the hell out of his ideas, his writing, and most of all the great example he set of how to be human.